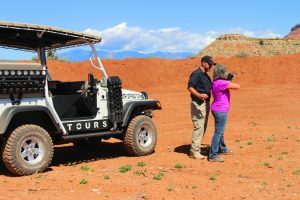 Zion Country Off-Road Tours has teamed up with Rowdy’s Range of St. George, Utah to provide our guests with the ultimate outdoor vacation package!! 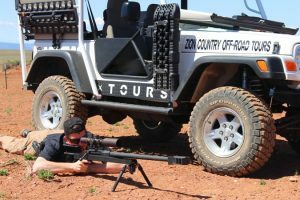 By combining an off-road jeep tour and an outdoor shooting range experience, you will create once in a lifetime memories in a single day. Offering daily departures at 9:45 a.m. (advanced reservations required) and accepting groups up to 11 people (children eight years of age and older). You will start your adventure by being picked up in Hurricane, Utah; centrally located between St. George, Utah and Zion National Park. Our custom-built safari jeep vehicle was designed with you, the customer, in mind – wide open 360 degree views, tubular half doors to keep you cool all summer long, and a fold down windshield allowing a fresh breeze to pass through. This is designed for people with an active lifestyle. 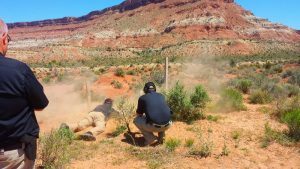 We will drive through the ancient limestone ocean bed to the top of the Hurricane Cliffs and out through a painted desert to arrive at the private outdoor shooting range, located in a pristine desert environment, where you will experience the liberating feeling of shooting pistols and long guns at targets with blue sky, clean air, and red rocks as your backdrop. We will finish this awesome excursion by descending the steep switchbacks of the Hurricane Cliffs mesa face, which is part of the historic Honeymoon Trail, to the Warner Valley desert floor where you will see the beauty of the Southern Utah desert and views extending out through the Arizona Strip. This custom tour package is approximately 3.5 hours long from pick-up to drop-off and meets at Lonny Boys BBQ located in Hurricane, Utah. NOTE: Please ensure that you book with both Zion Country Off-Road Tours and Rowdy’s Range as outlined below as they are separate booking modules. Please note that services rendered are provided by each company individually and therefore, appropriate tipping should be provided to each company separately while on the excursion. If you have questions please call (801) 616-1270 before booking online. This package allows you, the shooter, the opportunity to fire two of the most common firearms purchased in America today. The AR-15 is the wildly popular sporting rifle that is modular, making it possible to customize it to the owner’s desires and preferences. The Glock 19 has been the most popular handgun for many years because of its reliability, cost, and the fact that it is estimated that 65% of police departments across the United States use Glock pistols. 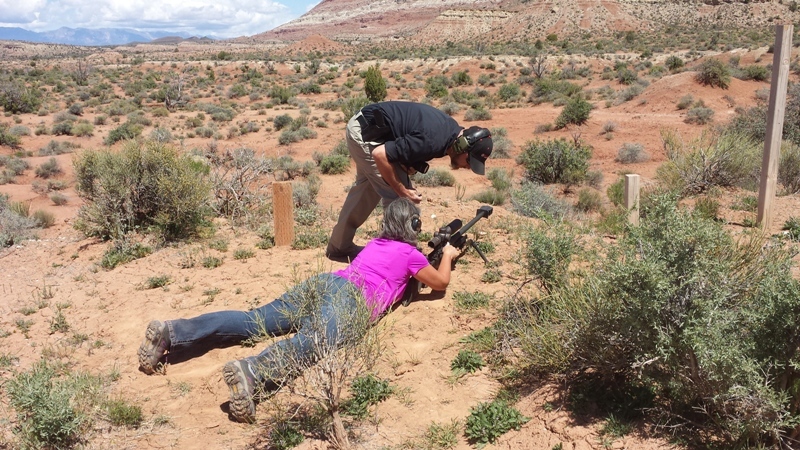 This package allows you, the shooter, the opportunity to shoot two popular long range rifles including the AR-50. 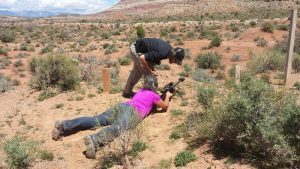 This rifle has a maximum range of 2,400 yards and is a definite must do for the guest wanting a once in a lifetime opportunity. (435) 215-9466 for reserving the Shooting Packages. Includes: A range safety briefing as well as all necessary eye and ear protection. Utah’s Dixie is a place of rich cultural and natural history when combined, make for one of the most amazing places to explore. Natural processes such as rock formation, erosion, uplift, and climate change have sculpted the scenery. In turn, these influences have commanded what animals lived here over millions of years. Dinosaurs, mammoths, giant sloths, and even jellyfish had their time in Utah as seen by the fossil record left behind. Humans made an appearance to southwest Utah eventually and each culture has left its mark as well. Native Americans, Spanish explorers, freedom-seeking pioneers, and now recreation seekers from around the world have all called Dixie home, even if just for a short while. For those willing to dig in, there is endless opportunity to learn, have fun, and take in the expansive wonders of Dixie’s past, present, and future. The first thing that often captures the heart of those visiting this corner of the world is the spectacular and otherworldly scenery. Giant red sandstone cliffs dominate the horizon in some areas while in contrast brownish drab wastelands lay below with their own beauty. The diversity of landscape you see is not by random chance. What you see is the constant interaction of environment and geology at work. When you look out across the horizon here, you are essentially looking back in time at the pages of history. Each rock outcrop, each sandflat tells a story of what happened here hundreds of millions of years ago through today. Oceans and great lakes have covered these lands and left behind sediments layer upon layer. Ancient water creatures can be seen in this rock frozen for a glimpse. A great desert similar to the Sahara dominated for millions of years and left us with the beauty of red, orange, and white sandstone rippled like art. And often times the bluish or purple layers record the days of dinosaurs when this area was covered with swampland. Today we are in the midst of erosional processes that reveal this amazing story to us. The cultural history of this special corner of the Wild West is a mix of triumph and loss as different native groups thrived and eventually disappeared across the span of time. There is archeological evidence of human habitation in the Dixie area dating back to 7000 B.C. The people living here 7000 B.C. to 300 B.C are classified as the Archaic culture. Next the Ancestral Puebloans (Virgin Anasazi) lived in the Dixie area 300 B.C. to 1225 A.D. Like all other Anasazi groups, these native people seem to have disappeared almost overnight with very few clues as to why. Shortly thereafter around 1250 A.D. the Paiute settled along the waterways of southwestern Utah, most notably the Virgin and Santa Clara rivers. The Paiute were able to sustain themselves by hunting small game, collecting plants and seeds, and farming small irrigated crop plots along the riverside. on the wild grasses the natives ate and spread new communicable diseases to unsuspecting Paiute. Eventually the Paiute were forcibly relocated to reservations to continue their culture, albeit crippled. It is a story told many times in America’s westward expansion, with only the names and localities being different with each telling. The first residents of the greater St. George, Utah area (Utah’s Dixie) struggled to adapt to the harsh and different environment. Nothing came easy – floods wiped out cotton and vegetable plots; the drinking water was overly silty and murky; the summer heat brought men and farm animals to their breaking point; quality lumber was hard to come by for building. With time, they learned and other people began settling in more remote areas such as northern Arizona and the Grand Canyon vicinity. St. George became the official hub of this entire region once the Temple of the Latter-Day Saints was built in the 1870s. The completion of the temple led to the creation of The Honeymoon Trail. It was used extensively for two decades by couples escorted by chaperones wishing to take vows in the St. George Temple as an act of faith. Two popular stops for honeymooners along the way were the famous Lee’s Ferry Crossing of the Colorado River and Pipe Springs near Fredonia, AZ. Even now you can see this wagon rutted trail in vast expanses across the Arizona Strip. Access to a reliable water source was an ever-present concern to all living in the desert lands of Utah and Arizona. If you had water, you had hope. Unfortunately for the Paiute people, the new settlers of the area did not view natural resources such as water as something to be shared, but to be owned. Thus, many important springs were actually fortified by pioneers and their establishment claiming they were protecting themselves from the threat of Indian attack. In reality it seems places like Fort Pearce of southern Utah and Pipe Springs of northern Arizona were built to squeeze natives out of their homeland by preventing access to clean, potable water. Begin planning your visit to Utah’s Dixie with the leads and information below. St. George Dinosaur Discovery Site at Johnson Farm A museum built over a large tract of dinosaur remains accidentally found as locals worked in the fields. 2180 E Riverside Dr. St. George, UT 84790. Red Cliffs Desert Reserve Discover diverse ecosystems in this 62,000-acre reserve focused on protecting the animals and plants that live here. This is a good example of the uniqueness of Dixie where the Mojave Desert, Great Basin and Colorado Plateau come together. Hiking, mountain biking, Native American archeological sites, Desert Tortoise and climbing opportunity abound. Warner Valley Warner Valley, named after the outlaw Matt Warner, is a maze of looping washes made for motor bike riding for hours on end. Also in the area are the Warner Valley dinosaur tracks and the Fort Pearce Historic Site mentioned above. For more information call the BLM Office in St. George (435) 688-3200. Sand Hollow State Park This beautiful blue lake surrounded by the reddest rocks you can imagine will confirm desert does not mean desolate. Whether you are into ATVing, boating, fishing, paddle boarding or just soaking in the sun, this Utah State Park offers it. Camping is available as well.